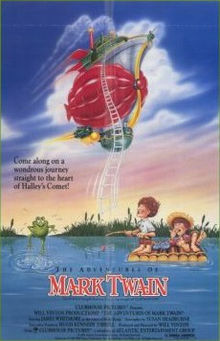 The Adventures of Mark Twain, released in the UK as Comet Quest, is a 1985 American stop-motion animation film directed by Will Vinton (best known for “The California Raisins” animation). It received a wider theatrical release, still limited to seven major cities, in May 1985. It was released on DVD in January 2006. The film features a series of vignettes extracted from several of Mark Twain‘s works, built around a plot that features Twain’s attempts to keep his “appointment” with Halley’s Comet. Twain and three children, Tom Sawyer, Huck Finn, and Becky Thatcher, travel on an airship between various adventures. Twain died April 21, 1910, one day after Halley’s Comet reached perihelion in 1910).